The Cazenovia College interior design program enjoys a highly successful record for job placement, including many graduates who are employed in design firms in New York City. 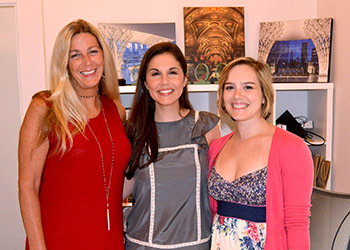 Perfect examples are three alumni who work at the firm Kugler Ning Lighting (KNL) – Amber Moriarty '06, Ashley Warner Moench '07, and Maggie Judge '09. Together the three are providing architectural lighting design for building façades, offices, restaurants and more in New York and around the world. The story begins when Amber Moriarty, originally from Liverpool, New York, was approaching graduation and knew she wanted to work in New York City. She had taken lighting courses from Professor Joe Ritter as part of her interior design curriculum and fell in love with lighting design. She interviewed with KNL over spring break, was hired, and began working as a designer the Monday after her last final. Moriarty credits the advanced lighting knowledge she gained at Cazenovia for her quick hire "They were impressed with the amount of knowledge I had about lighting and the work in my portfolio," she says. A year later when KNL had another opening for a designer, Moriarty suggested Ashley Moench for the position. The two had taken classes together and Moriarty was impressed with Moench's work and knew she had the same advanced lighting knowledge base. Moench, originally from Delhi, New York, interviewed in May 2007 but was nervous with the prospect of moving to New York City. Knowing Moriarty and how much she liked working at the firm helped convince Moench to accept the position. Once at the firm, Moriarty served as a mentor and helped her adjust to working in New York City. Reflecting on their work relationship Moench says, "Amber trained me. She helped me grow both personally and as a lighting professional." Maggie Judge took a different route to becoming a lighting designer at KNL; however, Moriarty and Cazenovia College are still the common threads. Originally from Southington, Connecticut, Judge moved to Cazenovia upon getting married and began taking classes toward an interior design degree while raising children and working part time doing residential designs. She eventually started teaching drafting and computer modeling at Cazenovia while she pursued her Masters in Fine Arts degree online from the Academy of Art University in San Francisco. Judge reached out to Moriarty regarding an internship at KNL during her last semester, which led to her being hired full time in August 2016. Reflecting on her time at Cazenovia College Judge says, "It was wonderful to go to school and teach there—I enjoyed so many aspects of that and miss it in some ways, but love what I'm doing here too." Judge credits Professor Betsy Moore as being instrumental in both her professional and personal life. Of Moore, Judge says, "She is a person who is able to resolve issues in all kinds of creative ways. When I was a student, she definitely helped me to stay on track with my school work and balance my home life—and was always very supportive and optimistic." In addition, Judge still keeps in touch with former students from her nine years of teaching at the College, including several who are also working in New York City. While Moriarty paved the way for Moench and Judge to join KNL, she has also experienced her own significant growth at the firm. She started as a designer, worked her way up to senior associate, was promoted to studio director in 2013 and was named principal, studio director in 2017. At any given time, KNL has eighty active projects in the studio split among three teams. As studio director, Moriarty manages dayto-day workflow—making sure all three teams run efficiently, have the resources they need, share product information, and meet deadlines. Regarding the KNL studio environment Moriarty shares, "We have a great office—everybody is friendly, works together, communicates—it's a really nice environment without egos—one we've worked hard to create." Moriarty, a member of the Illumination Engineering Society (IES), also oversees lighting design projects such as Industry City Masterplan in Brooklyn, the Jarmulowsky Bank façade on the Lower East Side, and Boqueria restaurant, Midtown. Other notable projects where she has been the lead designer include Samsung 837 (Samsung’s new experience center) in the Meatpacking District, Proenza Schouler in SOHO, Nomura Holding America headquarters and another Boqueria restaurant on the Upper East Side. 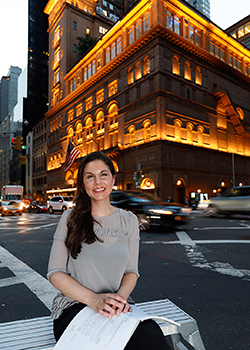 A project that Moriarty is particularly proud of is the façade of Carnegie Hall, a National Historic Landmark whose exterior had never been illuminated. The design features layers of light from the street to the top of the building. It was a challenging project involving new LED lighting technology. Extensive on-site mockups were conducted to review LED distribution, color, output, attachment methods and sightlines. Over 130 linear feet of LED were temporarily installed in thirteen locations on two façades. All tests were completed between midnight and 6 a.m. to reduce the amount of public buzz surrounding the project. The design also included custom shields painted the color of the exterior to hide the lights during the day, and implementation of a dimming system to bring the lights on gradually as the sun sets. The project took several years to complete and was recognized with a prestigious Lumen Award in 2015. When it comes to her approach to lighting design, Moriarty recalls a philosophy she learned from Professor Ritter … "You can have a great design, but if you don't know how to light it, it really doesn't matter." She notes that it is exciting to work with architects and interior designers to create unique designs and spaces. "Given the opportunity to be involved early in the process, lighting designers can collaborate with the design team to affect the architecture and create some really exciting moments." Moriarty adds, "If you don't notice the lighting but the space looks great, that means we've done our job." As for advice to students, Moriarty is a big believer in internships. "Do as many internships as you can," she says. "School is wonderful but getting an idea of what it is like to work in an office environment is really important, and if you complete more than one internship you start to understand what aspects of your field you enjoy the most." Moriarty ocompleted two internships while at Cazenovia—one involved filing design samples and materials and the other was designing retail fixtures. She was particularly appreciative of the second internship because she was treated like staff and got to experience what it was like to work with budgets and meeting clients' expectations. She notes that she now treats the KNL interns the same way. Moriarty and her husband, Patrick Courtney, recently welcomed their first child, Lilly, born in October 2016. When thinking of the future, Moriarty reflects that KNL has offered her much growth over the last eleven years and there is plenty more to come. She also looks forward to getting more Cazenovia College students jazzed about a career in lighting design.